The Oscar nominees gathered Monday at the Beverly Hilton in Beverly Hills, Calif., for the first time since being nominated on Jan. 23. It may have been a warm and sunny day in Beverly Hills, Calif., on Monday, but inside the Beverly Hilton, the atmosphere was just as warm and inviting. The Oscar nominees gathered for the first time since being nominated on Jan. 23. 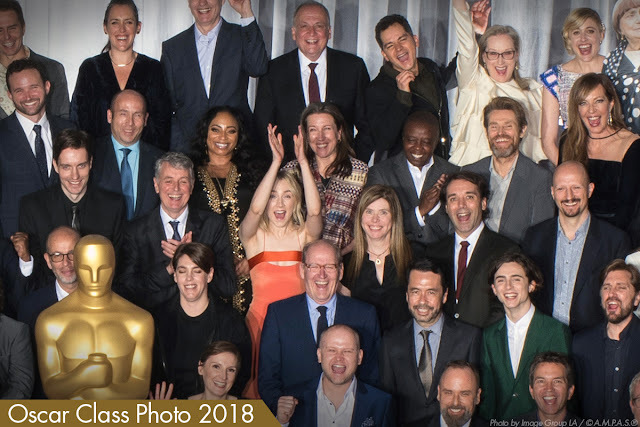 Honored actors and directors, in addition to more than 150 other nominees, hobnobbed amongst each other in a day of celebration less than four weeks before the big ceremony. Nominees and invited guests dined on Chilean Sea Bass with mango, red and white quinoa, roasted asparagus, crispy shallots and oven-roasted tomatoes. Wines on the menu were annual standards: Loveblock Sauvignon Blanc, La Crema Pinot Noir and Piper-Heidsieck Champagne Brut. And don't forget dessert: Mini lemon tart, mini tiramisu cup and fresh berries! 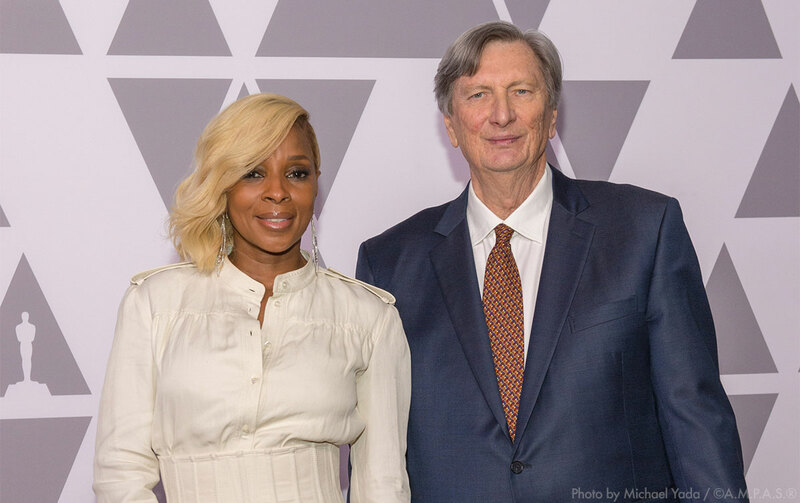 Oscar nominee Mary J. Blige with Academy President John Bailey. Academy President John Bailey welcomed guests at the start of the luncheon and commented on the current climate of Hollywood and spoke of changes within The Academy’s own organization. 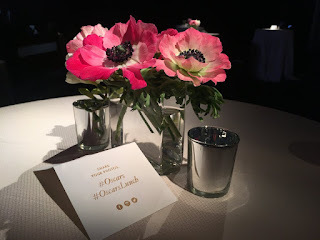 Join us on our Instagram Story as we share with you photos and videos from inside the annual #OscarsLunch. The luncheon is known for its “Class Photo,” where all of the nominees get on bleachers and have their photo taken. Laura Dern, two-time Oscar nominee and an Academy governor in the Actors Branch, read off the names of the nominees, who them headed to the risers for the photo. Second Row: Thomas Lennon, Peter Spears, Sidney Wolinsky, Jakob Schuh, Scott Frank, Jan Lachauer, Scott Benza , Darla K. Anderson, Alex Gibson, Gary Rizzo, Daniel Phillips, Laurie Metcalf, Nora Twomey, David Malinowski, Luis Sequeira, Christopher Townsend, Daniel Barrett, Stephen Rosenbaum, Jeff White, Mark Bridges, Tobias Rosen, Joel Whist, Emily V. Gordon and Kumail Nanjiani. Third Row: Ru Kuwahata, Jonathan Amos, Douglas Urbanski, Dana Murray, Justin Paul, Richard R. Hoover, Carter Burwell, Matthew Wood, David Heilbroner, Feras Fayyad, Kate Davis, Eli Bush, Paul Machliss, Eric Fellner, Megan Ellison, Richard Jenkins, Ren Klyce, Timothée Chalamet, Ruben Östlund, Shane Vieau, Dan Laustsen, Elaine McMillion Sheldon, Kerrin Sheldon, Dave Mullins, Rachel Shenton, Mark Mangini, Anthony Leo and Mark Weingarten. Fourth Row: Michael Semanick, Mike Mulholland, Gabriel Grapperon, Lisa Bruce, Kazahiro Tsuji, Julie Goldman, Nathan Robitaille, Bruno Delbonnel, Victor Caire, Sally Hawkins, Diane Warren, Bryan Fogel, Lee Smith, Kevin Wilson Jr., Arjen Tuiten, Daniel Lupi, Saoirse Ronan, JoAnne Sellar, Nelson Ferreira, Ivan Mactaggart, Emilie Georges, Doug Hemphill, Katie Spencer, Daniel Kaluuya, Dennis Gassner, Lucy Sibbick, Gregg Landaker, Christian Cooke, Graham Broadbent, Max Porter, and Stuart Wilson. Sixth Row: Alexandre Desplat, Mary J Blige, Amy Pascal, Gary Fettis, Octavia Spencer, Guillermo del Toro, Ben Morris, Aaron Sorkin, Kristie Macosko Krieger, Jeff Melvin, Hoyt van Hoytema, Andrey Zvyagintsev, Sarah Greenwood, Jason Blum, Chris Nolan, Sam Rockwell, Emma Thomas, Steve James, Joe Letteri, Carlos Saldanha, Meryl Streep, Greta Gerwig, Agnès Varda (cutout), JR, Tatiana S.Riegel, Steven Spielberg, Luca Guadagnino, Ramsey Naito, Julian Slater, Lonnie Lynn, Ron Bartlett, Pete Czernin, and Theo Green.